What FormSite Triggers and Actions are Supported? New Form Result - Triggers when a user submits a new form result. After you create your form in your FormSite account, find your Zapier integration information on your form’s Form -> Integrations -> Zapier page. You will need this info for the next step. In your Zapier account, start making a new Zap. Select FormSite as the Trigger app and choose your Action app. Click "Connect" to start linking your FormSite Account . Next, name your connection and enter your FormSite API Key, Server Prefix, and User Directory. Zapier will validate your integration settings and you can continue setting up your Zap! 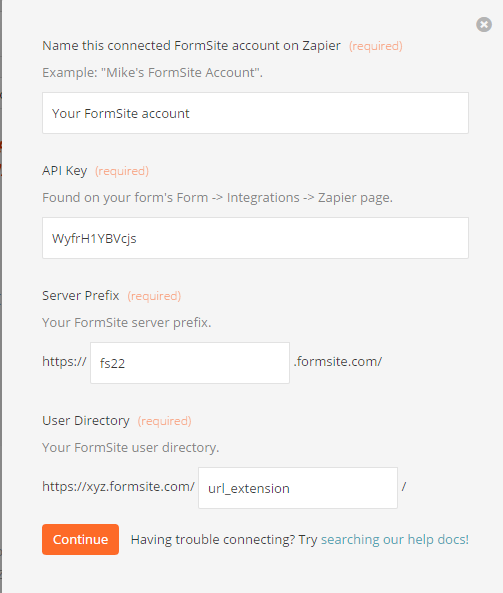 If you change your FormSite account's URL Extension or API Key, you will need to reconnect your FormSite account within Zapier. If you change your form's Form Directory, you will need to reconnect any Zaps using that form in your Zapier account. Unfortunately the integration doesn't support Matrix nor Multi-scale items at this moment. Please see if you can pipe the answers from those items to Hidden Field items and then use those for mapping instead.